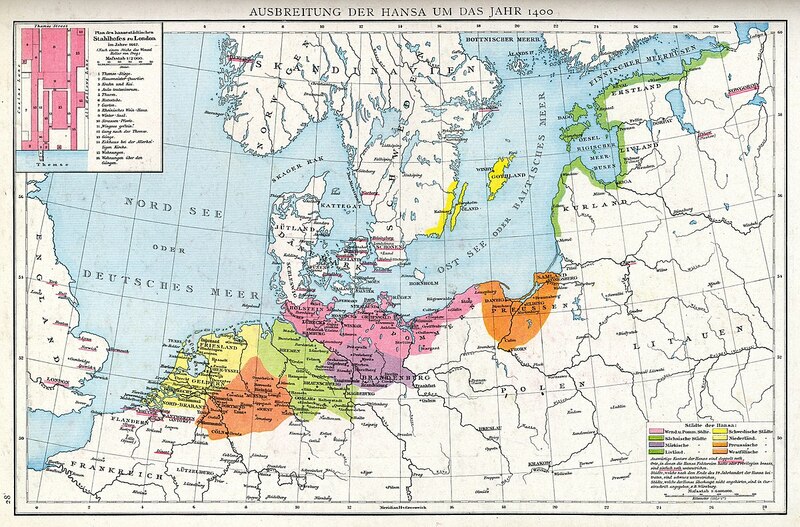 The Hanseatic League (also known as the Hanse or Hansa; Middle Low German: Hanse, Dudesche Hanse, Latin: Hansa, Hansa Teutonica or Liga Hanseatica) was a commercial and defensive confederation of merchant guilds and their market towns. Growing from a few North German towns in the late 1100s, the League came to dominate Baltic maritime trade for three centuries along the coast of Northern Europe. It stretched from the Baltic to the North Sea and inland during the Late Middle Ages and early modern period (c. 15th to 19th centuries). Hanse, later spelled as Hansa, was the Middle Low German word for a convoy, and this word was applied to bands of merchants traveling between the Hanseatic cities whether by land or by sea. Hansa societies worked to remove restrictions to trade for their members. Before the "official" foundation of the League in 1356, the word Hanse did not occur in the Baltic language. Gotlanders used the word varjag. The earliest remaining documentary mention, although without a name, of a specific "German commercial federation" is from London 1157. That year, the merchants of the Hansa in Cologne convinced Henry II, King of England, to free them from all tolls in London and allow them to trade at fairs throughout England. The "Queen of the Hansa", Lübeck, where traders were required to trans-ship goods between the North Sea and the Baltic, gained imperial privileges to become a free imperial city in 1227, as its potential trading partner Hamburg had in 1189. Despite its collapse, several cities still maintained the link to the Hanseatic League. Dutch cities including Groningen, Deventer, Kampen and Zutphen, and a number of German cities including Bremen, Demmin, Greifswald, Hamburg, Lübeck, Lüneburg, Rostock, Stade, Stralsund and Wismar still call themselves Hanse cities (their car license plates are prefixed "H", e.g. "HB-" for "Hansestadt Bremen"). Hamburg and Bremen continue to style themselves officially as "Free Hanseatic Cities. ", with Lübeck named "Hanseatic City" (Rostock's football team is named F.C. Hansa Rostock in memory of the city's trading past.) For Lübeck in particular, this anachronistic tie to a glorious past remained especially important in the 20th century. In 1937, the Nazi Party removed this privilege through the Greater Hamburg Act possibly because the Senat of Lübeck did not permit Adolf Hitler to speak in Lübeck during his 1932 election campaign. He held the speech in Bad Schwartau, a small village on the outskirts of Lübeck. Subsequently, he referred to Lübeck as "the small city close to Bad Schwartau." The members of the Hanseatic League were Low German merchants, whose towns were, with the exception of Dinant, where these merchants held citizenship. Not all towns with Low German merchant communities were members of the league (e.g., Emden, Memel (today: Klaipėda), Viborg (today: Vyborg) and Narva never joined). On the other hand, Hanseatic merchants could also come from settlements without German town law—the premise for league membership was birth to German parents, subjection to German law, and a commercial education. The league served to advance and defend the common interests of its heterogeneous members: commercial ambitions such as enhancement of trade, and political ambitions such as ensuring maximum independence from the noble territorial rulers. Decisions and actions of the Hanseatic League were the consequence of a consensus-based procedure. If an issue arose, the league's members were invited to participate in a central meeting, the Tagfahrt (lit. "meeting ride," sometimes also referred to as Hansetag, since 1358). The member communities then chose envoys (Ratssendeboten) to represent their local consensus on the issue at the Tagfahrt. Not every community sent an own envoy, delegates were often entitled to represent a set of communities. Consensus-building on local and Tagfahrt levels followed the Low Saxon tradition of Einung, where consensus was defined as absence of protest: after a discussion, the proposals which gained sufficient support were dictated aloud to the scribe and passed as binding Rezess if the attendees did not object; those favouring alternative proposals unlikely to get sufficient support were obliged to remain silent during this procedure. If consensus could not be established on a certain issue, it was found instead in the appointment of a number of league members who were then empowered to work out a compromise. The Hanseatic kontors each had their own treasury, court and seal. Like the guilds, the kontors were led by Ältermänner (sing. Ältermann, lit. "elderman," cf. English aldermen). The Stalhof kontor, as a special case, had a Hanseatic and an English Ältermann. In 1347, the kontor of Brussels modified its statute to ensure an equal representation of the league's members. To that end, member communities from different regions were pooled into three circles (Drittel, lit. "third [part]"): the Wendish and Saxon Drittel, the Westphalian and Prussian Drittel as well as the Gothlandian, Livonian and Swedish Drittel. The merchants from the respective Drittel would then each choose two Ältermänner and six members of the Eighteen Men's Council (Achtzehnmännerrat) to administer the kontor for a set period of time. In 1356, during a Hanseatic meeting in preparation of the first Tagfahrt, the league confirmed this statute. The division into Drittel was gradually adopted and institutionalized by the league in general (see table).